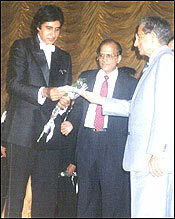 When I first met Amitabh Bachchan, he was already a star. It was about three years before the catastrophe on the sets of Coolie (1982). Before I met Mr Bachchan, I didn't have a very high opinion about film stars. But Mr Bachchan was wonderful. That is the only word to describe him: wonderful. He was referred to me by a general practitioner who called me in for a detailed checkup on Mr Bachchan. I went to his house in Juhu [in northwestern Mumbai], which was our first meeting. I was completely charmed by him. He was very articulate, had an excellent command over both English and Hindi and wanted to know what was being done. He precise choice of words to convey what he felt was really amazing. Once the checkup was over, he walked me to my car, which is not something most patients do. It was an awesome feeling. I was thrilled and completely happy to meet him. He started calling me Sir, which he continues even today. He is always respectful to many of my senior colleagues, too. It is amazing to see a man who, at the height of his success, is so humble. It is difficult to find people like him. After our first meeting, we occasionally kept in touch when he called a few times for medical advice. Then one day, about three years later, I was in a corner of J J Hospital in Mumbai when I found my wife was trying to get in touch with me urgently. She had got a call from the Bachchan family asking for me. I was told Mr Bachchan was hurt and I would have to go to Bangalore to St Philomena's hospital where he was then admitted and help bring him to Mumbai. There was very little time to get ready. I found that everything was taken care of. The air tickets were ready, the transportation was there and, within minutes, I was flying to Bangalore along with Dr Shirish Bhansali, a surgeon. When I reached Bangalore, I found his condition was so bad that there was no question of moving him. So we waited there. For four whole days. Mrs [Jaya] Bachchan, Mr Bachchan's brother Ajitabh, or Bunty as he was called, and his wife Ramola were waiting with us. They were a pillar of strength and took care of everything. I had come with just a small examination bag. But within a few hours, all the essentials and other items that I required were there. The family worked very hard to organise things. Some of his closest friends and, of course, Coolie director Manmohan Desai were there throughout. When his condition stabilised, we put him in an ambulance and took him to the airport. That is when I realised how popular he is. There were people running behind the ambulance. It is quite a distance between the airport and hospital. I wondered whether people would really run all the way. As a doctor, I am not really engrossed in movie stars or their lives. Yes, I watch movies and had seen Mr Bachchan's films, but it never really sunk in how big a star he is, till that moment when I saw people running behind the ambulance. Before we reached Mumbai, our only additional request at the Breach Candy Hospital, where he was to be admitted, was for a longer bed for him since he is so tall. He was an excellent patient, extremely cooperative. It was a critical situation but he pulled through. Once he started recovering, he never made any fuss. On the days he was feeling better, he would even start whistling. Though he is normally quiet and tight-lipped, he was very jovial during his stay in hospital. He would joke with the nurses. He also kept asking me if he could act in movies again. I would say yes but he would keep asking me again and again. We couldn't believe he could laugh at himself like that. He had a great sense of humour and an amazing way with words. Through that difficult period, Mrs Bachchan kept her calm and presence of mind. There was a stage where we had to do a small operation on his windpipe. We told Mrs Bachchan while asking for her consent that the operation could damage his voice. But Mrs Bachchan said immediately, 'Doctor, please do whatever is essential. He is more important to us than anything else.' It was a spontaneous statement, straight from the heart. It touched us all. Mrs Bachchan stayed in the hospital from the morning to night, taking notes about his condition, various reports and organising things. Despite the intense pressure and tension, she did not forget the small things. After I came back to Mumbai and finally went home after two long nights at the hospital, she sent a bouquet of flowers to my house to express her gratitude. It was a remarkable thing to do. Even at such a critical moment, she had the grace to appreciate how hard everyone was working to save her husband. After he recovered, I did not see much of him. But he has never forgotten me or the time he spent at the hospital. Recently, we had a new endoscopy centre at the Breach Candy Hospital. I called him to ask whether he would inaugurate it. He didn't hesitate for a moment, didn't ask which date or want to look at his diary. He just said yes. When he came for the inauguration he gave one of the most moving speeches we had heard. His command of English is impeccable and he has an excellent voice. When he told us the hospital was like a second home to him and that he could still spot the nurses who had looked after him so well, it was very touching. Some nurses even started crying. He put his feelings into words so nicely. There was another incident when students at the Grant Medical College in Mumbai, where I teach, wanted him to be the chief guest at a college festival. I hesitated calling him up, but the students went ahead and called him, saying Dr Shah had asked them to. Again, he immediately agreed. The fondest memory of him would be the time when he came to my house. I couldn't have asked for more. He is a very humble person.